Skopje is the capital of the Republic of Macedonia. 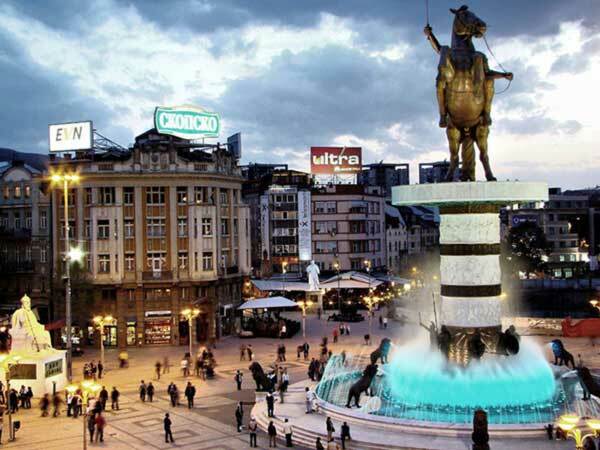 As largest city in the country, it is a political, economic, and cultural center of Macedonia. It lies on the upper course of the Vardar River and is located on a major north-south Balkan route between Belgrade and Athens. 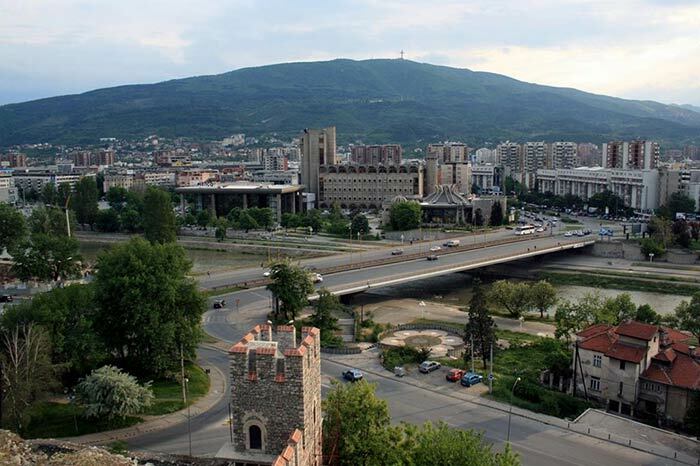 The first impression of the visitor to Skopje, is invariably the same: it is a new and modern city. A trading center for the cotton, tobacco, grains, and livestock produced in the surrounding region, the city also manufactures iron and steel, electrical machinery, chemicals, textiles, carpets, and food. View from the Turkish Kale. Here is the seat of the Macedonian Academy of Sciences and Art, the Ss. Cyril and Methodius University, the Macedonian Parliament, the National and University Library, the Macedonian National Theater, the Archives of Macedonia, the Skopje Historical Archives, the clinics of Faculty of Medicine, the Museum of Macedonia, the Museum of Contemporary Art, the National History Museum, the Art Gallery, the Gallery of the Cultural and Information Center. 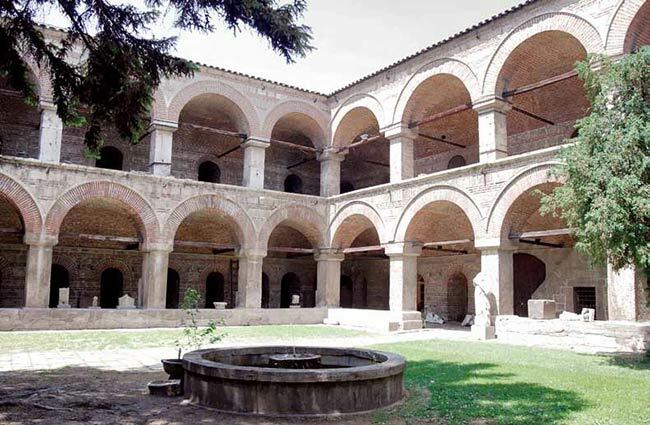 Skopje’s history can be traced back from around 4th century BC. According to some scholars, the town was initially peopled by an Ilirian tribe, the Peonis, while others say it was built by the Dardans. In the Roman period the town is mentioned under the name of Scupi. In the 4th century AD, it served for a while as the capital of the Emperor Theodosius and in 518 AD, was struck by a disastrous earthquake. Scupi flourished under the reign of the Emperor Justinian, who according to some evidence, was born in a nearby village (Tavor) and some historians take this to mean that Scupi may be the site of the famous town of Justiniana Prima. After Justinian’s death the Slavs captured the town in the year 625, giving it the name it still carries today – Skopje. The Slav tribe Berziti settled here and also populated the western part of Macedonia all the way to Ohrid, Bitola, and Veles. In 1040, Samoil’s grandson, Petar Deljan, led an uprising against Byzantium which liberated the city, but the uprising was ceashed. Another uprising, under Georgi Vojtek followed in 1072 and again the center of it was Skopje. This uprising, was also put down. Skopje was part of the Serbian state until the arrival of the Turks who seized it on January 19, 1392. During the Turkish reign, the Karposh Uprising was crushed down, and its leader Karposh was captured, cut to pieces, and trowen from the Stone Bridge, into the Vardar River. After five centuries, the Balkan Wars of 1912, forced the Turks out, and Skopje fell under Serbian rule and after World War II, it became a capital of the Republic of Macedonia. In 1963, another catastrophic earthquake struck Skopje. The clock in the preserved ruins of the old railway station remained frozen on 5:17, the moment that the predawn earthquake turned Skopje into landfill. So devastating was the 1963 quake that some advised moving Macedonia’s capital to another site. Thanks to world solidarity, the city was quickly renewed and reconstructed, and the new residential quarters bear little resemblance of old Skopje. Today Skopje is a beautiful and modern city with population of over half-million people (1991), covering an area of 1.818 sq. km. The city was rebuild mainly out of concrete slab, clamping it to the Vardar river floodplain almost as a modular unit, in case the earth attempts to shake it loose again. Among the many international architects that participated in its reconstruction was the Japanese urban planner Kenzo Tanga, who gave the center a “city wall” of high-rise buildings, while the banks of the Vardar were laid out as pleasant tree-lined promenades. The ancient trading quarter (charshija) has been completely renovated in the notable features of its original architecture. Today, the city is still spreading in all directions and has a number of new developments. The city and its vicinity have plenty of valuable cultural and historical monuments which attract the attention of every visitor. Kurshumli-An, located in the old section of Skopje is believed to be erected in 1550. This building later became a prison, where 578 Macedonian revolutionaries went through during 1898. The roof of this building was originally made of lead which was later taken out and used to produce bullets. The Kale Fortress raised in the 6th century (its present appearance dates from the Turkish period), Daut-pasha’s baths (15thc., now the Art Gallery), Mustafa-pasha’s mosque (15th c.), the Clock Tower (16th c), and the Stone Bridge over River Vardar that gives access to the old part of the city of Skopje with its many cultural and historical monuments. Built by the Turks on the site of a Roman bridge, it has eleven arches and bears a plaque in middle stating that it was restored by Sultan Murat II (first half of the 15th century). 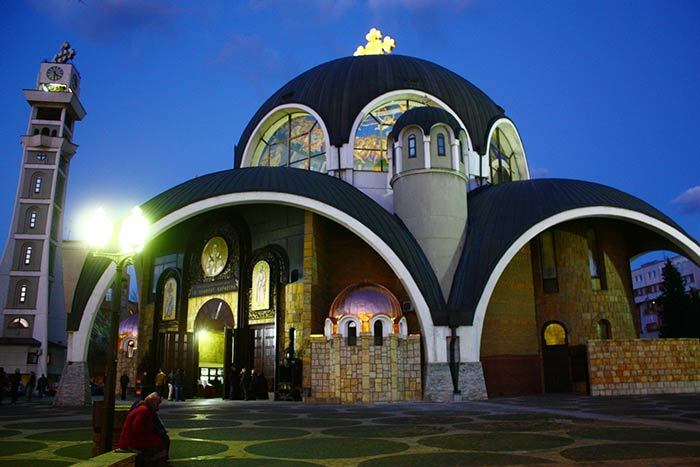 The Church of the Holy Savior (Sveti Spas) is located near the Kale Fortress. It was believed that it dates from the 17th century, but the 1963 earthquake gave a evidence that it actually dates from the 16th century, which proves that today’s church was build on the foundations of some older church which the Turks have destroyed. 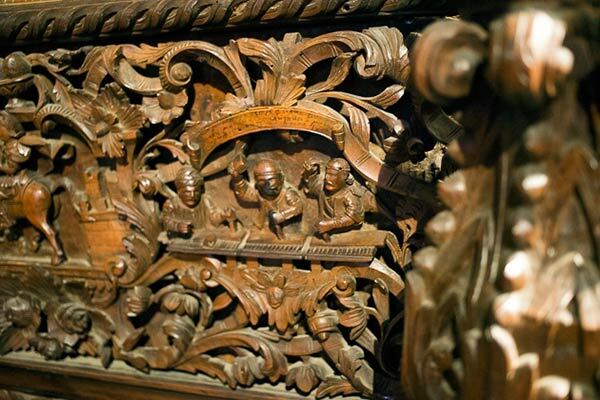 The 19th-century iconostasis of the Church of the Holy Savior, carved in walnut, combines a profusion of plant and animal motifs with the figures of saints in local costumes. This realistic high-relief carving is the work of skillful craftsmen of the Debar area, who included their own figures in one corner of the iconostasis. The iconostasis at Holy Savior church 6 meters high and 10 meters long, and is one of the finest samples of traditional woodcarving which can be found on the territory of Macedonia along with the iconostasis of St. John Bigorski Monastery. In the yard of the church is located the tomb-sarcophagi of the greatest Macedonian Revolutionary, Goce Delchev, who died in 1903 in Banica, near Seres in Aegean Macedonia. On the slopes of nearby Mt. Vodno stands the famous church of St. Panteleimon from 1164, decorated with frescoes of exceptional artistic value. 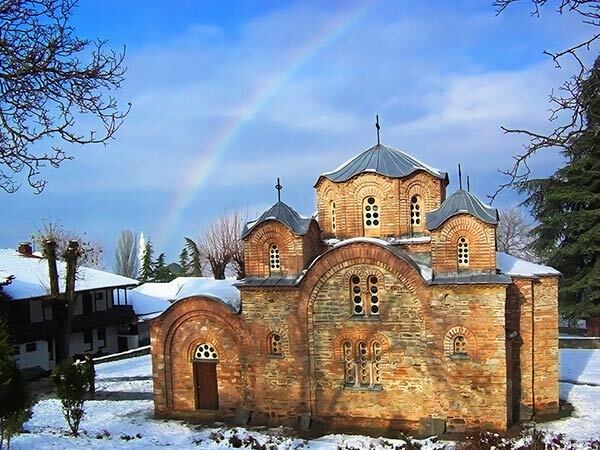 The Monastery of St. Nikita (14th century), Marko’s Monastery (14th century) and the Monastery of St. Andrew (14th century) are situated in the vicinity of Skopje. Near Skopje, is located Lake Matka which is utilized for energy production. St. Nikola Monastery (17th centtury), Matka Monastery (15th century), and the Church of St. Atanasie (16th century), are all situated in Matka. Skopje can be reached by train, car, or air. The Skopje Airport is the largest airport in Macedonia. The first train to arrive in Skopje, was from Salonica in the distant year of 1873.